This entry was posted in Uncategorized on March 14, 2014 by Chris Francese. With generous support from the Andrew W. Mellon Foundation, Dickinson College invites applications for a postdoctoral fellowship in Digital Humanities in the academic year 2014-15, with the potential for an additional year of support. The Fellow will work as a catalyst for faculty innovation by planning, promoting, and implementing strategies to encourage faculty discourse about pedagogy, e-learning tools, and the integration of digital media into teaching and scholarship. The postdoctoral fellowship is an academic appointment reporting to the Dean of the College through the faculty chair of the Digital Humanities Advisory Committee, but the Fellow will be housed alongside the Instructional Technology staff in the Library and Information Services division. The Fellow will a) teach one or two courses each year within his or her area of academic research; b) guide arts, humanities, and humanistic social science faculty in the use of digital tools for curricular and research purposes, and help them develop digital humanities projects; and c) work with LIS staff to train students in the January Digital Humanities Boot Camp to use digital tools and technologies in order to prepare them for significant student-faculty research collaborations. The Fellow will be eligible for the internal grants for pedagogical innovation, as well as standard faculty support for travel and professional development. The salary will be $50,000 plus benefits. 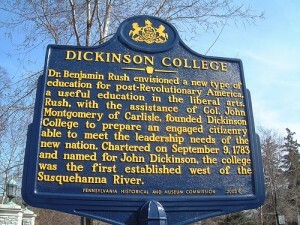 Dickinson College is a private, highly selective, liberal arts college located within two hours of major research institutions and metropolitan areas. The Fellow must normally have received the PhD by July 1, 2014, and within the last four years, and not have held a tenure-track position. Candidates should be conducting research that requires demonstrated expertise in the use of Digital Humanities in their scholarly field. This entry was posted in Uncategorized on March 13, 2014 by Chris Francese. 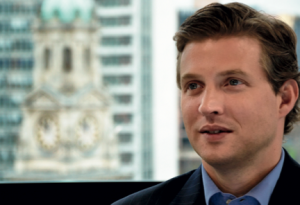 The Dickinson Student Senate Public Affairs Committee is pleased to announce that Alec Ross, the first Senior Advisor for Innovation to Secretary of State Hillary Clinton, is coming to speak at Dickinson College. Ross, who spearheaded President Obama’s technology and innovation plan and developed a digital payment platform for soldiers in the Congo, will explain Bitcoin’s origins, operations, and pitfalls, and describe the impact of the rise of digital currency on financial institutions, international politics, and global poverty. Ross will also and examine the implications of broader digital payment structures like Google Wallet, Square, and Simple on the world financial system, and argue that these changes are indicative of the demand for interdisciplinary approaches to banking and digital finance. Ross will give his keynote address at 7PM in Allison Hall on Wednesday, March 26th, 2014. I hope you can join us! This entry was posted in Events and tagged Alec Ross, Bitcoin, Student Senate on March 12, 2014 by Chris Francese. From scribbled marginalia to full-scale scholarly treatises that gobble the works on which they comment, text annotation is one of the most basic and diverse activities of the humanities. Its purposes embrace the intensely personal, the didactic, and the evangelical. It serves all kinds of communities, from the classroom to the law court, from the synagogue to the university research library. 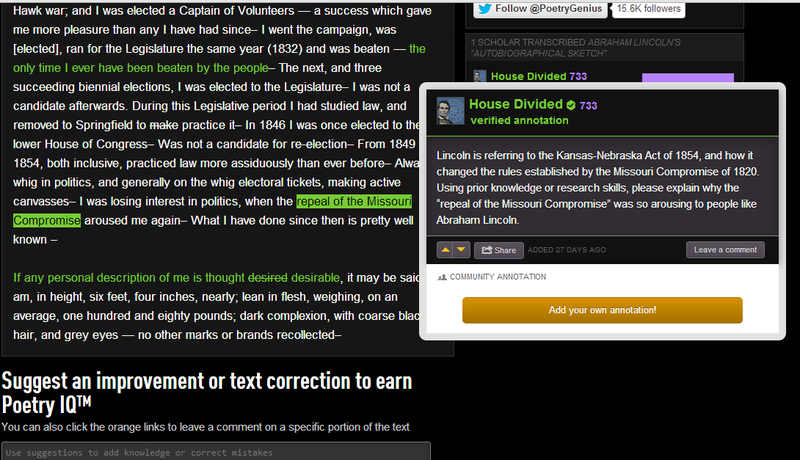 The movement of text annotation to an online environment is still very much a work in progress. There are many platforms attempting to marry original text and a stream of added comments, some attractive and functional, some awkward. 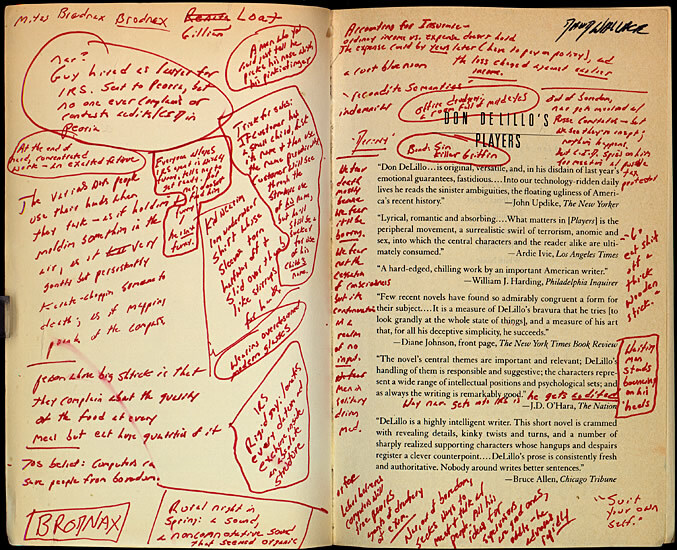 Crowd-sourced annotation is being tried in many corners, and sometimes it catches on (check out the remarkable wiki commentaries on the novels of Thomas Pynchon), sometimes they build it and nobody comes. Rap Genius and its sister sites Poetry Genius and Education Genius are the most exciting recent entrants into this field. What distinguishes these sites is first the astonishing ease and flexibility of the interface. The mere selecting of a chunk of text allows one to add not just a typed comment but audio, video, links to parallel passages, embedded tweets, virtually anything digital. The other good thing about the Genius sites is the way they tap into existing communities of fans, readers, teachers, and students. Education Genius is well-funded by venture capital and has a staff that talks directly to teachers, works to make the site useful to students, and builds bridges with other sites and institutions. A case in point is the emerging collaboration of Education Genius with Dickinson’s House Divided Project. An annotated version of Abraham Lincoln’s 1859 autobiographical sketch is now available at Poetry Genius, and represents the beginning of partnership between the House Divided Project and the Genius platform spearheaded by Dickinson College student Will Nelligan (’14). There is a general annotated guide to the sketch, which was originally written for a Pennsylvania newspaper when Lincoln was a presidential candidate, and also a version especially designed as an open Common Core platform. This is in keeping with the strong educational outreach of House Divided and its director, Associate Professor of History and Pohanka Chair in American Civil War History Matthew Pinsker. There is an audio recording of the sketch in the voice of Lincoln as recreated by Todd Wronski, part of a larger multimedia edition of Lincoln’s writings being undertaken by House Divided. 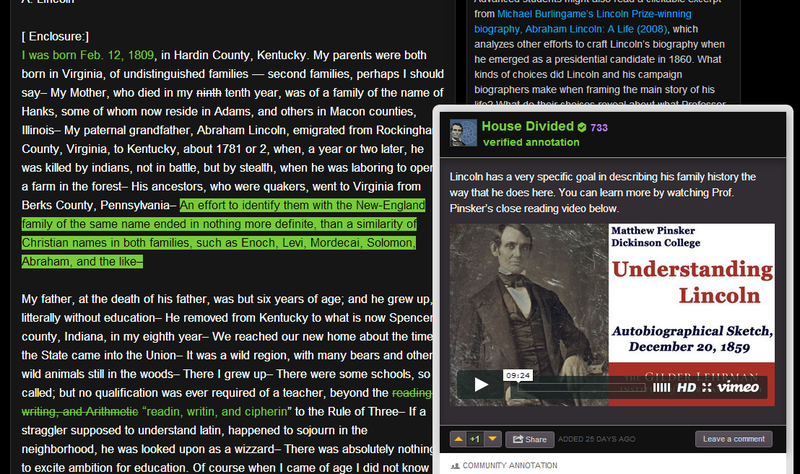 In the Genius platform clicking on different colored text brings up an annotation. Here is one with an embedded video player. Note that annotations are fully “social,” in that one can give them a thumbs up or down, share in various ways, and leave a comment on the comment. Clicking on different colored text brings up the annotation, in this case one with an embedded video player. One can easily create an account and start annotating. House Divided’s annotations often take the form of questions. The idea of annotating with questions, in addition to statements, is a fine one, helpful to teachers and students alike. 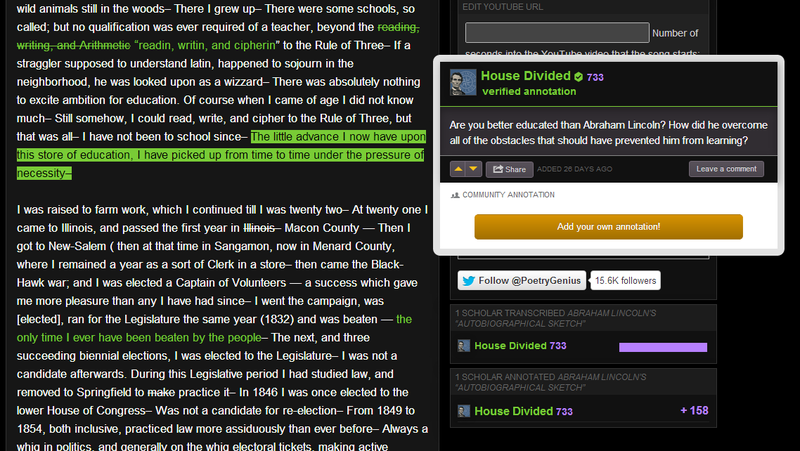 Note also the ability to brand annotations with the House Divided logo, which marks them as more authoritative and “verified.” The folks at Poetry Genius understand the power of reputation, and unobtrusively include it in the platform in a variety of ways. 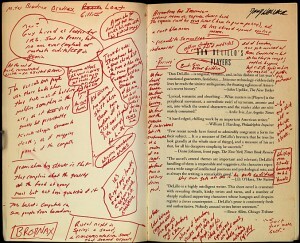 The ease of annotation—one can sign up for an account in a moment and fire away—makes this platform well-suited to “class-sourcing,” the adding of content by students under academic supervision, and in fact that is how these particular annotations were created. High quality content created collaboratively for a well-defined audience in an attractive, open, and flexible format: digital humanities doesn’t get much better than that. I am delighted to say that Jeremy Dean of Education Genius will be visiting Dickinson on April 17, 2014 to speak with a group of faculty and students about text annotation and to further develop this collaboration between the Genius sites and Dickinson College. If you would like further information about this event please contact me (francese@dickinson.edu). This entry was posted in Events, projects, Uncategorized and tagged House Divided, Poetry Genius, Rap Genius on March 9, 2014 by Chris Francese.